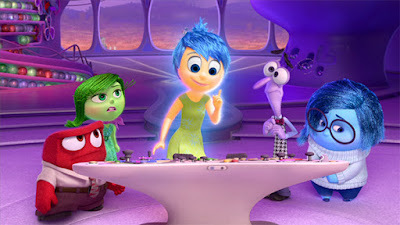 This summer, Disney/Pixar released the movie Inside Out. It's a great animated portrayal of the inner workings of 12 year old Riley's mind. In the film, the mind is an ever-expanding land of complexity, where emotions are personified, one's train of thought is an actual train, and memories are discrete balls stored in rows upon rows of shelves, catalogued and available for retrieval and playback. The movie was a lot of fun to watch but it shouldn't be taken too literally. Most people understand that they don't have real little people in their heads causing feelings of joy, sadness, fear, anger, and disgust. While Riley is capable of displaying each of these emotions, they are not discrete entities, but aspects of a single mind. The film falters in not showing how the person Riley chooses to interpret and govern her emotional inputs. A person acting on pure emotion would be unintelligible; they would be nothing more than an animal. There's something governing her understanding of herself and her feelings. Rationality, reason, and self-understanding are also parts of Riley the film doesn't show. Emotions cannot be responsible for virtue. It is the person of Riley who is responsible for these things. Emotions are not building blocks of the mind. They emanate from the mind, they don't comprise it. I bring this up because I want to highlight a mistake in thinking that many atheists make in assuming God is a complex being. As I explained yesterday, some atheists hold the design argument to be something along the lines of the complex nature of the universe argues for a creator. They raise the objection that if the complexity of the universe points to God, then God—who is infinitely more complex than the universe itself—must also have a creator. In my last post, I highlighted two ways this kind of thinking runs awry. But the biggest problem with the objection is it simply mischaracterizes God. The primary breakdown in the atheist's argument is the claim that God must be somehow more complex than his creation. Such an assumption is unnecessary and it runs counter to the concept of God that Christians have held for nearly two millennia. Christian theology has held that God is ultimately a simple being, one unable to be divided or separated into parts. The word simple may be used to mean "easy to understand." In other contexts it can also mean ignorant or uninformed. But philosophers use the term simple to mean something that is a total unity; it implies there is no way to break the essence of God into "building blocks" that together comprise who he is. A car is a complex machine that can be broken down into sub sections (drivetrain, electrical, suspension, braking system, etc.). These systems can be broken down further into parts. The parts are made of specific materials, and the materials are made from elements, the elements from molecules, and so it goes. Augustine grounds the unchangeableness of God to his simplicity. In City of God XI, 10 he writes, "There is, accordingly, a good which is alone simple, and therefore alone unchangeable, and this is God. By this Good have all others been created, but not simple, and therefore not unchangeable. "1 Here, Augustine sets out the argument that anything that can be broken down into smaller parts like the car implies it is contingent. God is a spirit, a divine mind with a unique nature. He cannot be divided "God parts" so-to-speak. God cannot be subdivided this way. The divine mind is a single entity, not something composed of building blocks. Just as our human minds are single entities capable of developing complex emotions, ideas, and thoughts, so God can be the source of a complex creation. 1. Translated by Marcus Dods. From Nicene and Post-Nicene Fathers, First Series, Vol. 2. Edited by Philip Schaff. (Buffalo, NY: Christian Literature Publishing Co., 1887.) Revised and edited for New Advent by Kevin Knight. http://www.newadvent.org/fathers/120111.htm.